Costco (NASDAQ:COST) saw its stock price increase by nearly 10% over the course of 2018. Much of that increase was due to the company’s strong comparable sales growth in the U.S., as well as international markets. We have a $238 price estimate for Costco, which is almost 15% ahead of the current market price. 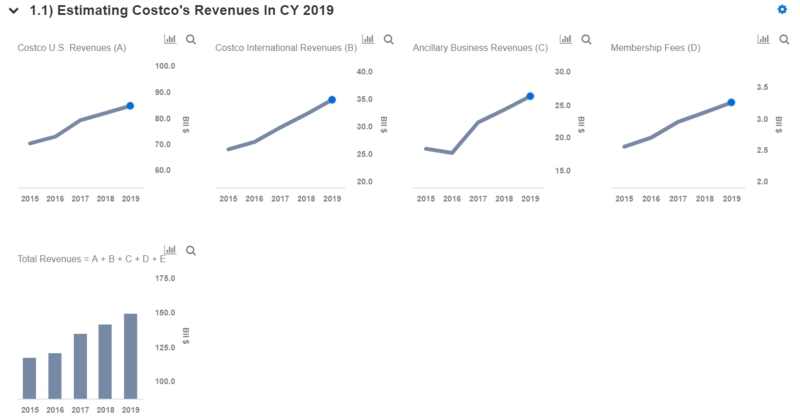 We have created an interactive dashboard on Costco’s Revenue and Cash Profits breakdown, which details our forecasts for the company’s revenue and cash profits in the calendar year (CY) 2019. You can modify our assumptions to see the impact any changes would have on the company’s earnings and valuation. We expect Costco to generate around $149 billion in revenues in CY 2019. Of the total expected revenues in CY 2019, we estimate $85 billion in the Costco U.S. business, almost $35 billion for the Costco International business, nearly $26 billion for the Ancillary businesses, and close to $3.3 billion in Membership income.